10 years on a chain. No blanket, toy, or bone. Often no clean food or water. AAS first saw her at night, lying in the frozen mud, being snowed and sleeted on. Lying in her own feces, surrounded by her own excrement. I just wish to God that I'd taken him when I first saw him, but at least the last year or two of his life will help to make up for all the years of loneliness. 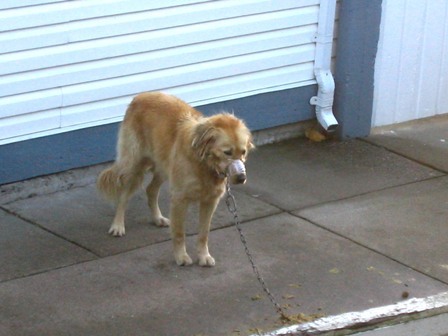 When she was still a puppy, Bella was put outside on a chain. She quietly endured seven years of heat, rain, cold, feces, and flies. 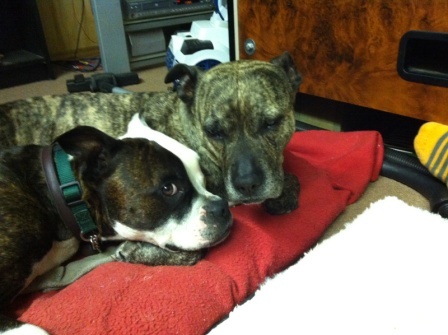 Appeals for help for Bella fell on deaf ears - until Animal Advocates was told. We heard. Bella was rescued and was found a real home, where she was treasured, where she was an equal member of her family, where she went everywhere with her family. Jelly lived the first months of her life on a concrete slab with no toy, no blanket and no one to pat her and tell her she was a good girl. She didn't know what love was as she had never experienced it but it was there inside her, buried deep just waiting for the chance to come out. 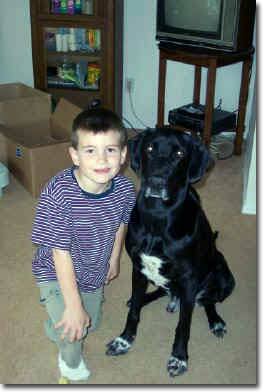 Hi, My name is Kristian, and I found a stray black lab with a very very sad story. According to the many people in my neighbourhood and at the pound who I spoke to, he was originally found running around on the highway, very cold and scared. He must have been on the run for quite a long time to get so thin and bony. We were told that a number of women in Kamloops BC were terribly concerned about a street-person's German Shepherd dog whose spine and hip bones were alarmingly prominent. Some of these women bought food for Buddy. 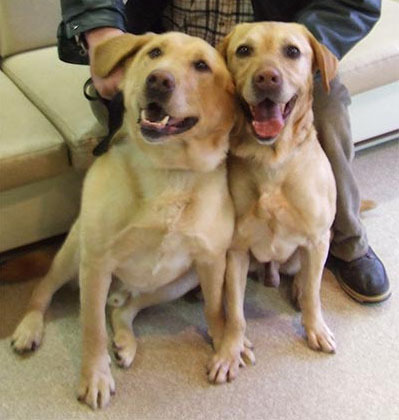 "Please, please can you help these two dogs penned their whole lives." Betty and Jake were kept in this pen for years of long, very cold winters, and long, very hot summers. They did have food, water and some shelter. But they had no life. And then one day... they disappeared. Animal Advocates had Betty spayed and Jake neutered, both tattooed, microchipped and vaccinated, before finding them the kind of homes that every dog has a right to. 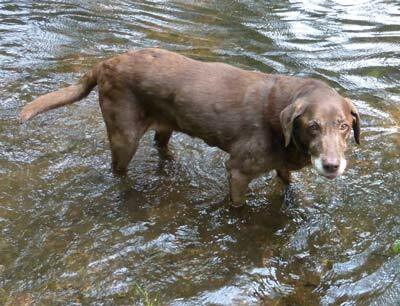 Both loved swimming, especially Jake, but then what Lab doesn't? Without their rescue, neither would ever have known the joy of swimming, or the comfort of love. 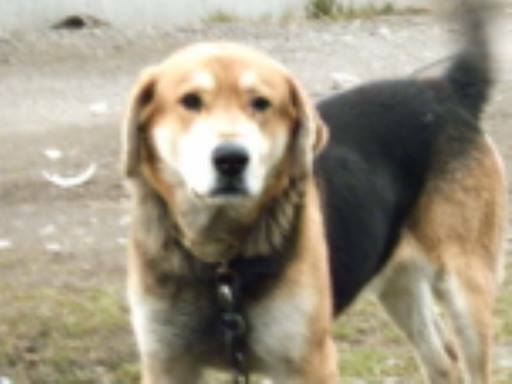 All alone... chained... -40 degrees in the Yukon... poor Diesel endured for four years until his rescue angels came for him. 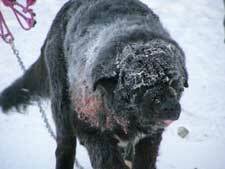 He was seen in the freezing rain, his tether was tangled and he stood there, his head down, drenched to the skin. Muffled cries of distress were coming from a cardboard box in Prince George BC. It was 35 degrees below zero, and it was only by luck that a woman heard those faint cries. 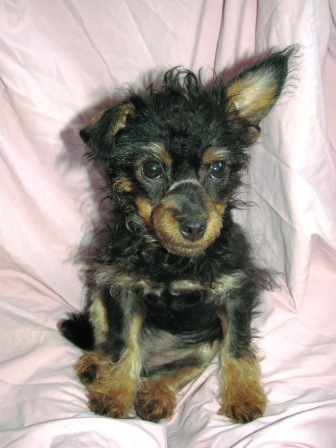 What she found in the box shocked her … a three-month old Yorkie-poodle pup with a thick rubber band around her muzzle. She must have been there several days because her lips and nose were so terribly swollen that they were almost beyond a vet's skill to save. She was weak and almost dead. Animal Advocates was asked for help. We said, "Yes, of course we will." 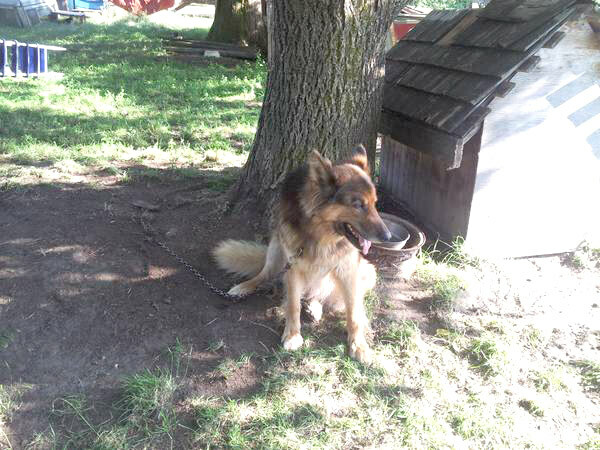 Animal Advocates got an email about a chained dog that is sadly, still common. 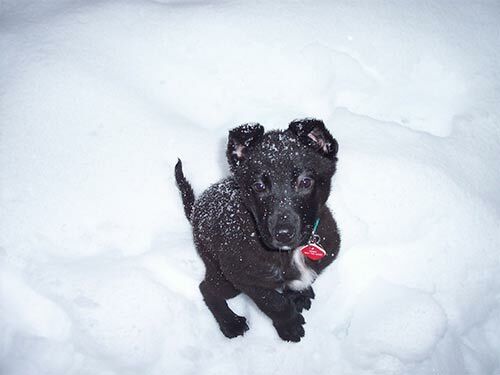 It was originally sent to the SPCA, but when nothing improved for the dog it was sent to AAS. 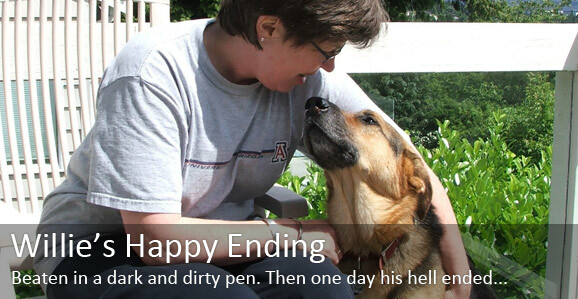 As you read Hap’s story keep in mind that the SPCA is the pound in this place, and since it does not do home-checks before or even after its "adoptions", Hap's abuser might have purchased it from the SPCA. 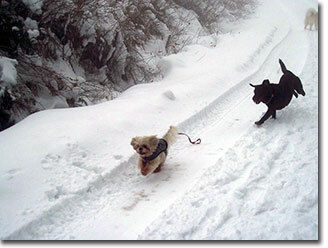 Bad winters mean there will be a lot of frozen dogs. Many get rescued. 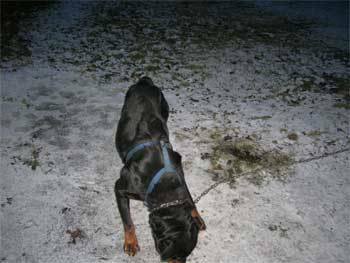 A young Rottweiler named Harley was one of the lucky ones. We found Annie and her pups like this, covered in flies, wet and dirty, Annie's chain too tangled for her to reach the dog house (which was full of dirt), so Annie had dug a depression in the mud for her pups. Another appeal to AAS, one of hundreds asking us to help an abused dog. "I live next to a dog who does not have a good life. His totally wrong name is Brutus. He is what you would call a 'yard dog'. A neighbour told me that he's been there for four years. He is penned alone outside all day every day, as well as every night. He's been left for up to 18 hours without food or water, and sometimes the water is frozen, so I sneak over and give him water..."
Shortly after I moved to Charlottetown P.E.I. from BC I took my dog for a walk on the next street where I saw a white Husky chained to a small disgusting doghouse which was surrounded by body-holes that the dog had dug. There was no shade or grass around the area. Every suffering animal needs to be heard. 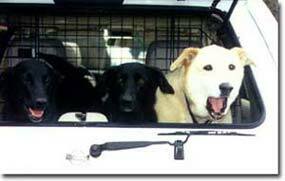 Dogs try to be heard by barking, but most of the time their barking is silenced. They have no voice — they have no choice. Unless someone speaks for them. Animal Advocates Society hears — and truly listens — to the voices of many suffering dogs. Marley was one. 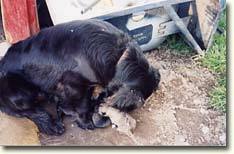 Chained and being bred, puppies in flies and feces, hidden in a filthy dark garage, Cassie hidden under a junked car, trapped by a heavy chain. This dear old boy spent his life, possibly ten years, on a lonely chain in a dirty yard, below 40 in Winter and scorching in Summer. He howled at night for most of those years. Did anyone care? No one did anything until an AAS rescuer did. For the first two years of his existence, Oscar was chained from dawn to dark in mud, feces, storms, heat and flies, all alone, and often frightened. When his owners got home, often late at night, Oscar was brought inside to conditions ever worse. He was locked in a crate, in the garage, unable to even stand up. 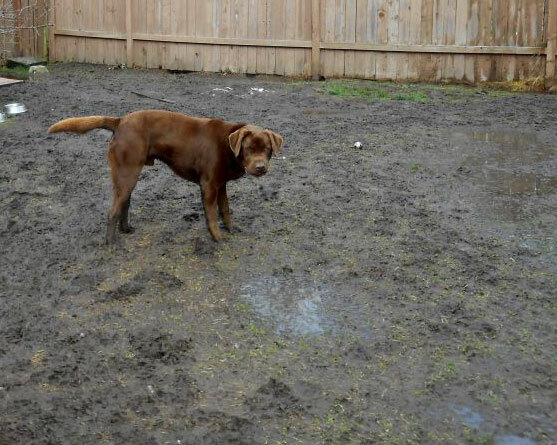 Chains, mud, filth, puppies, and loneliness. Not any more. Finally these two brave and terrified women did the humane and moral thing...they removed Duffy one day and they found him the home that he deserved. Buzz endured this existence – in a dirty, hidden prison – for four years. There was nothing for him to see but trees. I will never forget how the look on her wee puppy face changed as it dawned on her that the someone who was coming into her pitch-dark scary yard might be kindly. Bubba gets out of prison. "Finally I couldn't bear it anymore and simply removed him from the prison he had done nothing to deserve. I can't even describe to you the feeling that I get inside when I think of Bubba's wonderful life that AAS made sure he has now." 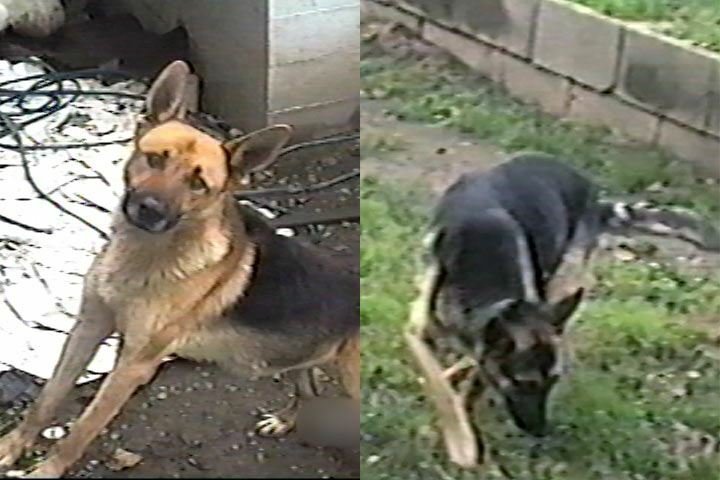 Tyke was kept in a garage for so many years that after he was rescued he became so hysterical if he thought he was alone again that AAS had him for almost two years while we helped him with his separation anxiety and searched for the right home. It doesn't get better than this. 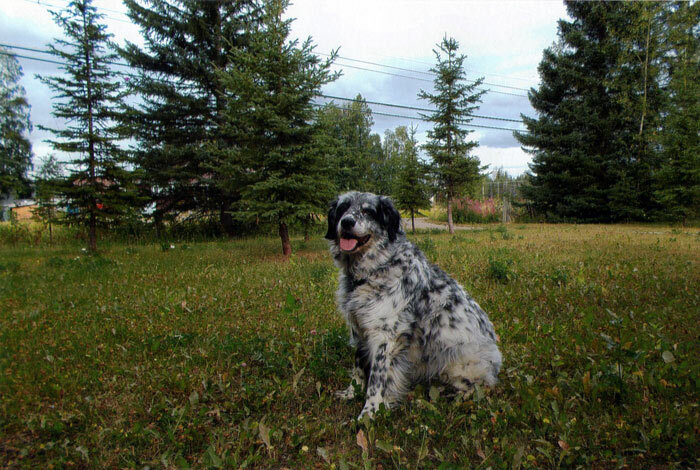 Animal Advocates Society was called by four different people in this dog's neighbourhood, and all of them had called the SPCA, one for many years. She lived (if you can call it living), on this chain for eight to ten years, her whole world just the porch and a plot of dirt at the bottom of the stairs, which was covered in many piles of diarrhoea. After seeing the condition that Nibbles was in, Cache Creek vet, Dr Quinn Gavaga (always called Doctor Quinn), called our rescue colleague to tell her that Nibbles was starting to really deteriorate and the surgery couldn't wait. He opened her up and found her intestine had been torn and feces was leaking into her body cavity, and two feet of her punctured intestine had to be removed. Doctor Quinn gave her a 50-50 chance. We got one of those phone calls that we have to brace ourselves to hear. It was from a single woman, elderly, in tears about the new puppy next door. The parents put him out on a chain a few days after getting him. A few days later, the children stopped coming out to play with him. So he cried his baby heart out day and night, only stopping if he thought he heard someone coming to him, or from exhaustion. Sweet (and stinky!) 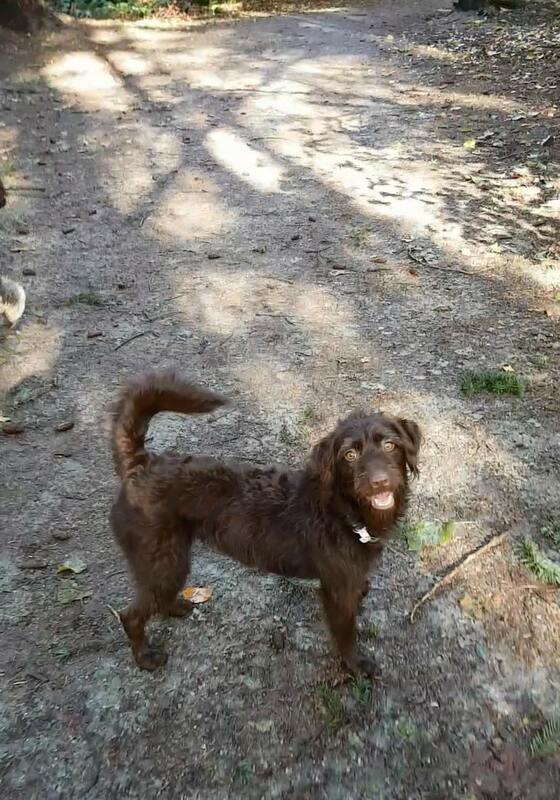 Dougie rescued after being abandoned and fending for himself for months. Email to Animal Advocates: "The situation is grim for this dog. She has been kept for four years in a cage measuring 8' by 14', and she is basically fed enough to keep her alive. I feed her whenever the owner is out. Often I give her water as well as she is not checked on a daily basis. Faeces is left in her cage (kept locked) for weeks at a time, and she is rarely walked..."
Shorty the Dalmatian's ears froze off. I am so glad to read about this at last because I know it is all true. I've had Shorty now for many years and though his cropped ears look pretty funny he doesn't mind because he is warm and happy after being sooooo cold ....and sooooo unhappy. Thank you, everyone who did this for Billie. 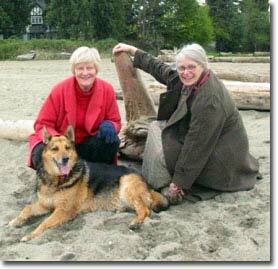 Sandy was removed from her chain by compassionate women. We said goodbye to our smiling, golden little Sandy today. 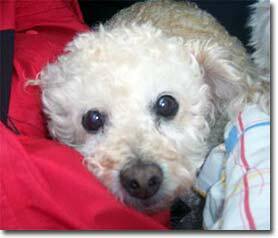 I held her in my arms and watched the light go out in her beloved eyes, and thought back to a Christmas Eve years ago when she came to join our family. Puppy Jack tried his best to guard the drug house. Over the years Animal Advocates has been called frequently by social service agencies asking for our help with a dog that needs AAS's rescue services. 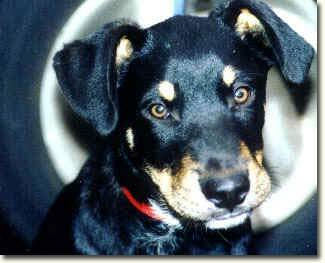 We were called about a pup, tied to the door of a derelict drug house in Vancouver's Downtown East Side where there are many homeless people and many people who prey on them. 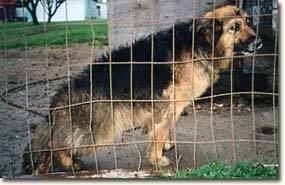 Animal Advocates has rescued many hunting dogs from the lonely lives many endure in dirty backyard pens. It's common for the dogs to be taken out for only the few weeks they are used to help the hunter hunt and kill, and sometimes for a bit of training. Animal Advocates Society gets many pleas for help to pay medical bills for rescued dogs. 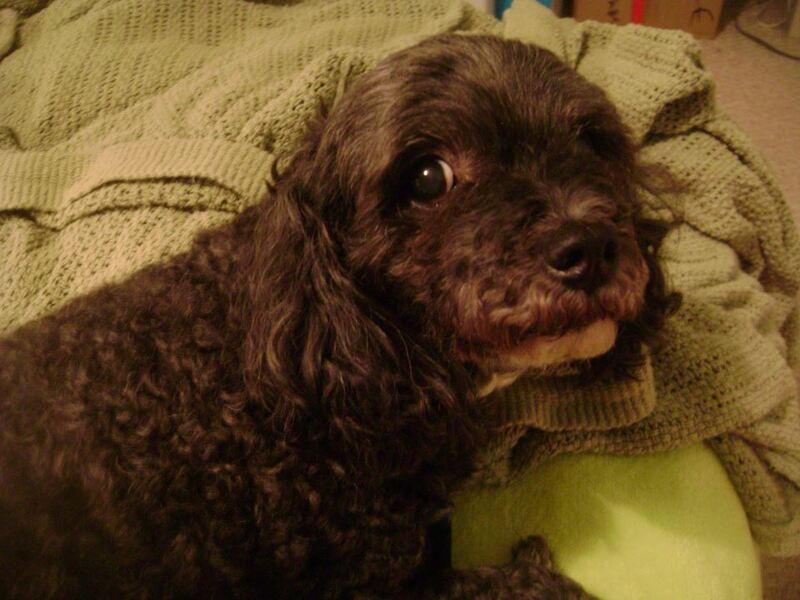 Allie was a worn-out breeder saved by a family who needed her as much as she needed them. But when the medical bills mounted up beyond the single mother's ability to pay, AAS stepped in and paid $500 so that Allie didn't suffer. From rescuer, Crystal Kerr..."Sweet Angelo - he really is a gentle soul. I hope to hear about the day he is snoozing in the sun, secure in his own skin, with a full tummy and not a care in the world. It's hard to believe that can even exist for him, because all I see in my mind is a skinny, dirty, frightened dog, gulping down any scraps of food he found and being terrorized by every other dog and human he encountered. Can't wait to see the pictures of him happy in his new home!!" 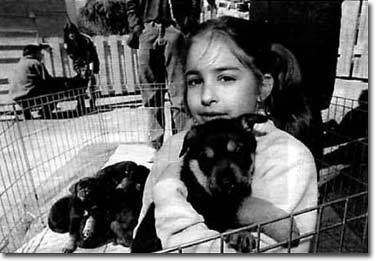 "Hello Animal Advocates, Can you help us with a very sick puppy named Baha? I was looking at Prince George Freecycle last night and that is where I found a lady who posted that she had 2 puppies to give away. One of the puppies is the one that we rescued from this home and need help for. Baha's condition is horrible. She has sores on her tummy, her legs, muzzle, and her eyes are red all around the edges. She has scabs on her stomach and legs and her muzzle from scratching so much." 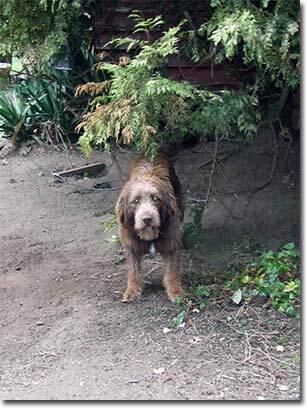 For more than twelve years Barney endured a life of misery on the end of a heavy chain that he had to drag. Twelve years of mud, ice, snow, numbing heat, flies, feces, urine, terrifying storms, lightning and thunder. Animal Advocates gets many emails a day from people who know of a dog who needs rescuing, who can't rescue the dog themselves, and who beg AAS to. 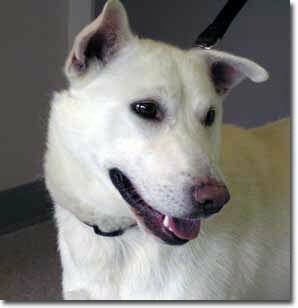 Beau, the Kumsheen dog is one of many who, against all odds, we were able to find, rescue and give a real home at last. Three of Boops' babies, rescued one at a time after they were sold to the "wrong" people. In the rough world in villages up the coast of BC, Billy's story is all too common. He was put outside when just tiny. Starving, wormy, and cold, then run over by his "owner" who had put him outside. 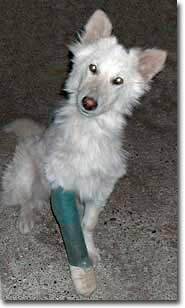 His hip broken, he still struggled to survive, creeping along ditches to try to escape the big pack dogs that harassed him and bit at his dragging leg. Thank God for Crystal Kerr who rescued him and flew him down to Animal Advocates. 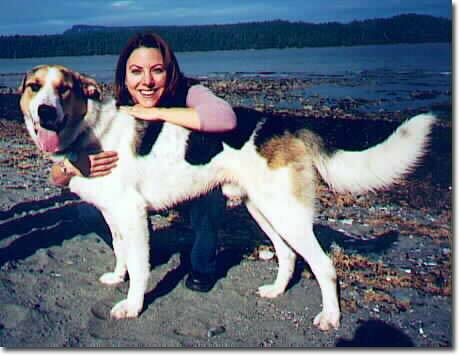 From the same fishing village up the BC coast where Billy, Angelo, and Patches were rescued from by the Crystal Kerr/AAS rescue team. Kids poked puppy Bobby in the eye with a stick. "Parents" wouldn't take him to a vet. 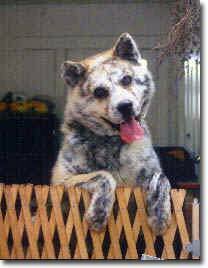 A beautiful purebred Akita, dumped at the pound with a deadly genetic disease. 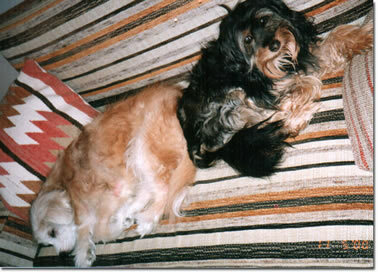 Two old dogs, matted and ill, awaited death. The street dog whose owner regularly beat and kicked him right on the street of Vancouver, until an avenging angel stepped in. If it weren't for a brave rescuer, sweet Cherie would have starved to death, imprisoned in a tiny crate. Chico is about 8 years old. He is very happy with my dogs and very social. We are calling him Chico because he was a little cheeky with my husband - wagging his tail and barking when my husband tried to play with him. 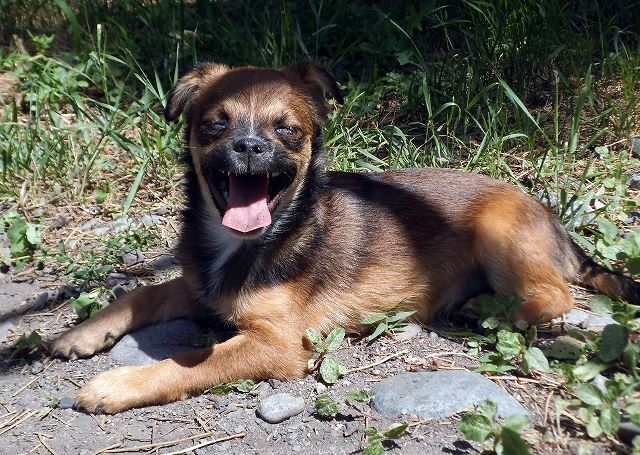 Chip is saved from destruction at the SPCA – thanks to quick action by Animal Advocates Society of BC and Chip's rescuer, Chip is still alive and happy. Bounced around like one of the balls he loves so much, now safe at last. In 2003, I was up North on business, in Fort Good Hope, just below the Arctic Circle, staying at a bed and breakfast. It was 70 below with the wind-chill factor and I was snug in my bed when I heard a dog howling. 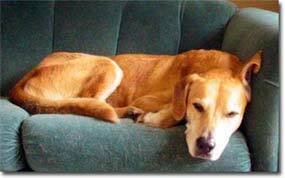 We were told that Hope had been a yard dog for a long time, rarely allowed inside. She never complained so not many people knew about her. Animal Advocates was able to rescue her. It had been slated to be destroyed. 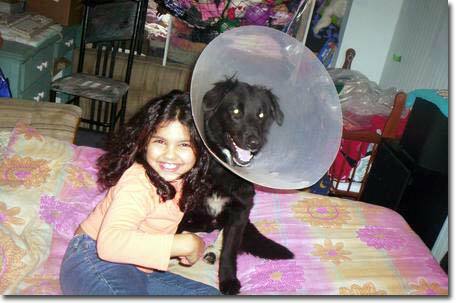 The dog had been a stray for weeks and had been transferred around several times. The cute little guy shook my hand with his paw through the cage and touched my heart in a way that forced me to take action to help him. She told us that she heard that Jasper was about to be surrendered to the BC SPCA and having much reason not to trust the SPCA she went and got him before that could happen. She told us that she drove an hour out of town to go rescue him. 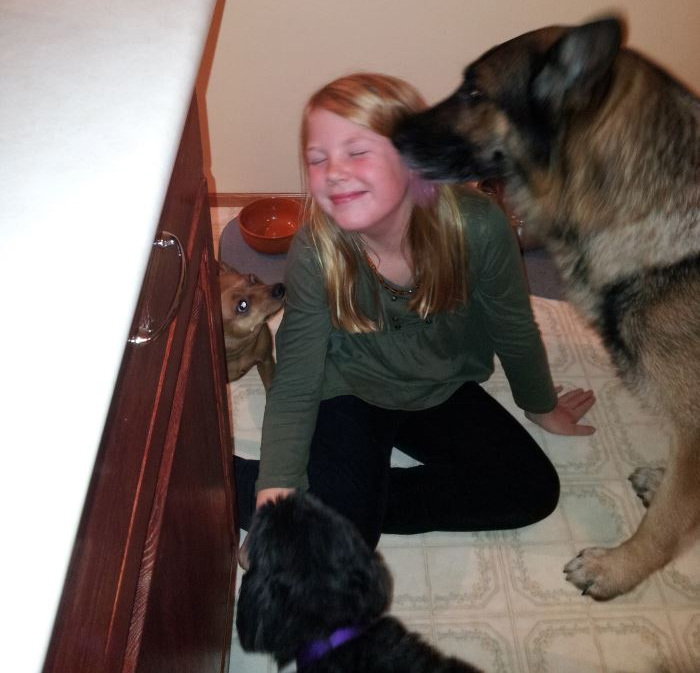 After a life in a crate this imprisoned girl blossomed into an affectionate, calm, confident and trusting soul. After six years, crouched in a basement stairwell on his chain, so afraid of anything unknown that his bladder and bowels emptied in fear when we called to him over the neighbour's fence. This little Dalmatian pup was the victim of the dog-reselling business. This SPCA officer also proceeded to tell me that if I didn't get my dog medical attention within the hour, he would arrest me, for animal cruelty, and seize the dog. I begged him to help me find somewhere to take my dog, he said the SPCA would take her and fix her, but then they would put her up for adoption, and I would not get her back. Markus is losing his will to live! He has been at Chilliwack Animal Control for over two months and during this time he has lost weight and is demonstrating how desperately he needs a family to call his own. Puppies like Morgan shouldn't have to be rescued from lives on the end of ropes. There should be a law against this in B.C. but there isn't, in spite of Animal Advocates' 10 years of asking municipalities. Another free-range dog from Bella Bella where it really is a dog-eat-dog world and tiny pups are put outside to fend for themselves - or die. Patches almost died. Hungry and scavenging as so many dogs must do in too many parts of BC, he ate rat poison - a large amount. If Crystal hadn't sent him down to AAS just at that time, he would have died a death of lonely agony in Bella Bella because within in a week of arriving in Vancouver he was near death. AAS and some very good vets saved his life (it took three blood transfusions) and now he has a "home" at last, with kids who he loves and is so good with. It would have been a great shame if Patches had died - everyone who met Patches on his road back to life said the same thing...this is such a nice dog. We are so glad you saved him. 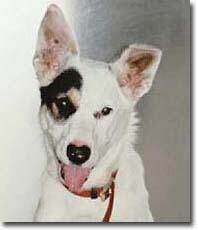 Click the link above for the story and pictures of Patches' ordeal and happy ending. She was only two months old when an Animal Advocates of BC colleague saw her teetering on the edge of a second-floor roof. She would peer over the edge, trying to judge if she could jump, then go back on the deck and scratch and cry at the door, unheard, or unheeded. She cried piercing puppy cries the whole time. If she'd been silent she may not have been heard and seen by our colleague and there may have been no puppy to rescue, just a corpse dangling on the end of the leash. From this...owned by a "hunter" near Vanderhoof who allowed him off his chain a few times a year to go hunting....to this....I truly believe in fate, and that Shadow was meant to be with us. 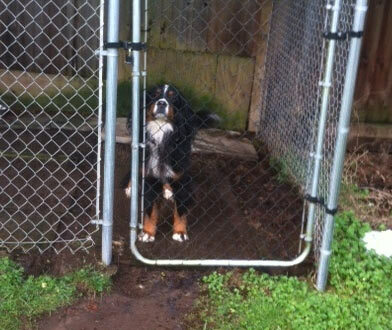 He will never again be chained,cold, isolated and lonely, and he will always be treated as a valued family member. Chiquita is a little old Chihuahua who was inherited by a woman when her uncle passed away. Chiquita's new family was devastated to find that little Chiquita had a very large growth on a mammary gland. They had instantly fallen in love with her but had no money to pay for this kind of expensive surgery. 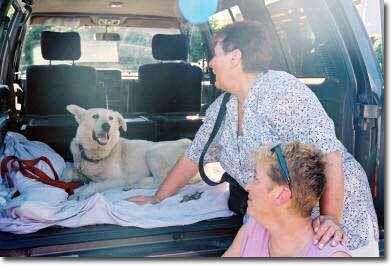 Sheba was a "car lot" dog, an all too common life for dogs. Vancouver has many car lot dogs; some live at the car lot full time like Sheba and some are rented by the night. Those are the saddest. Sherman was advertised on Craigslist as a "Free Dog". He was originally owned by an older couple who kept him chained as a guard dog. He had been on the end of that chain for many years, never once allowed inside the house or given the opportunity to sleep on a comfortable bed. Chilliwack Animal Control (the Chilliwack pound) sent an email to the rescue network about a very young, ailing, pup who needed out, quickly. Only 8-weeks old, he had worms, lice, fleas, and was not doing well in a pound; in fact, there was some concern about how long he would last. AAS got back instantly and told CAC to get the pup to their vet as quickly as possible, get him treated for all the parasites, and board him in the warmth of the clinic until we found a foster home for him. 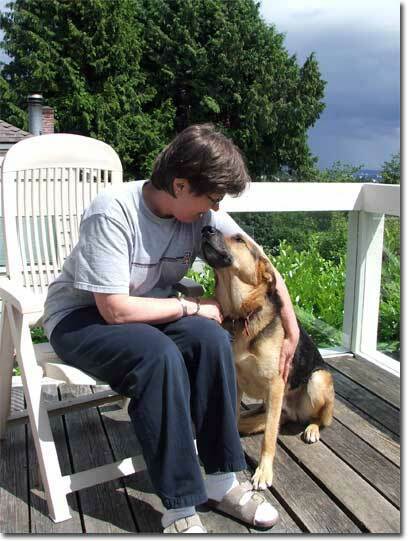 We did - we asked Diane who has fostered so many dogs for AAS, and she said yes. 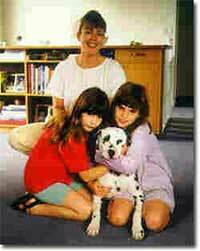 When we got Skeeter he had a bladder infection, which Diane, with all her years of valuable experience, recognized. That day, Skeeter was in to our vet, and antibiotics were started. When we got the call to help a wandering dog with no I.D. it was clear he had been hit by a car. His jaw was distended at a bizarre angle and one eye had hemorrhaged and was very red. Despite being overbooked, the vet made room for him and he determined that, yes, the dog was most likely hit by a car and his jaw was broken. 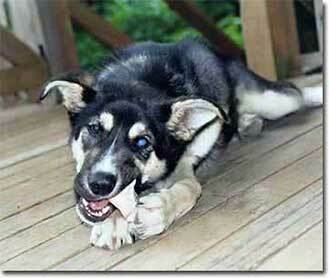 ...was sold by the SPCA for $110.00 to an AAS supporter with her teeth in this condition. We had her back x-rayed, we did a geriatric blood panel to determine her general state of health (good except she has a slight heart murmur that is not slowing her down at all, but may require medication in the future) and we had her plaque-covered teeth cleaned and two rotten teeth removed at a cost of $563.00. Night was falling and the puppy was howling and alone. There was no water, no food. My children and I walked over to the pup and sat with him because he was scared, shaking and obviously desperate not to be alone. From under the wheels of a parked 18-wheeler truck a tiny dog was seen running for its life by a kind man who managed to scoop it into his arms after a mad and scary chase for both of them. If the tiny dog ran back across the busy road, this time it may not have made it. The kind man took the trembling dog to his office where he gave it some water and made it a bed in box until he could take it home and feed it. 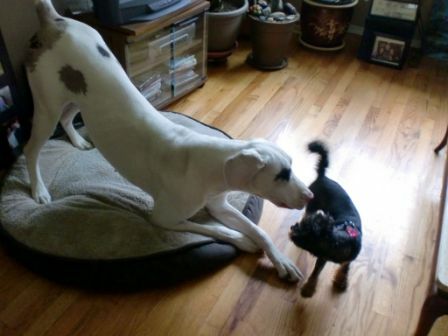 A lady went to buy a pup from a Great Dane breeder and saw Willow, an eight week-old puppy, walking into everything, barely able to walk, scared and crawling around. The breeder said she was going to put her down as she would be "no good". So the lady took Willow along with two more puppies. Willow adapted for most part, though needing to be guided when in a new place and still walking into things and hitting her head, which was not good at all. She was easily scared by sudden noises and movements. 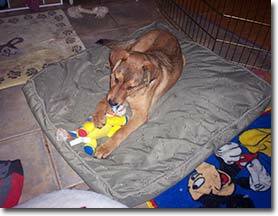 AAS got this email, one of hundreds we get a year asking us to help an abused dog: "Two weeks ago we rescued a young dog who had been mainly in a crate outside in the rain and cold and heat for her whole life and the people who owned her moved away and left her! She was emaciated! We took her home in hopes of keeping her, however, she is an extremely active dog and we don't have time to train her properly."